1081 Italy (24) 5 Lira 1874 & 1877 together with other bronze & silver coins. Generally AVF or better. 1462 Italy (5), l Lira 1886R, 5 Lira 1872BN, 1873BN & 1927R, 10 Lira 1927R. AVF or better. 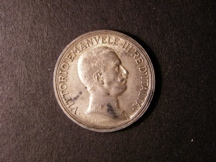 1701 Italy (80) mostly 19th & 20thC. 5 Lira 1874 & 1879 together with assorted low denomination in silver & copper. Generally VF or better. 1376 British Military Authority notes c 1943 (5) 1/-, 2/6, 5/-. British Armed Forces 1/- and Tripolitania 10 Lira. P.O.W. Camp note 3d stamped 1945. Fine or better.